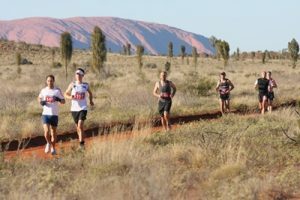 Voyages Ayers Rock Resort will host the eighth Australian Outback Marathon on 29 July 2017 and this year is set to be the largest to date, with the event selling out two months earlier than last year. With just over seven weeks to go, approximately 600 entrants, including a number of sponsored students from Indigenous communities, are set to pound the red dust with spectacular views of Uluru and Kata Tjuta. Entrants are from 29 countries including Australia, Austria, Canada, China, Croatia, Denmark, Finland, France, French Polynesia, Germany, Hong Kong, Indonesia, Italy, Japan, Kenya, Republic of Korea, Malaysia, Netherlands, New Zealand, Norway, Philippines, Portugal, Senegal, Singapore, South Africa, Switzerland, Taiwan, the United Kingdom and the United States. Race organiser and sports tour operator, Travelling Fit, has designed the event to be enjoyed by all levels of running abilities and four different events are available: a full Marathon, Half Marathon and 11km and 6km fun runs. The course is relatively flat with only a few inclines and sand dunes, and is mostly on unsealed roads, bush tracks and soft-sand trails. Ray Stone, Voyages Executive General Manager Sales, Marketing and Distribution, commented: “We are delighted to partner with Travelling Fit once again for this memorable race which has become a key fixture on the Australian running calendar since launching in 2010. With the combined support of Voyages Indigenous Tourism Australia and Travelling Fit, these students have been invited to take part in the event and will receive accommodation, meals, entry to the race, transport, race shirts and more. Local Yulara students will also be invited to participate in the race.